Get Trynbuy India Free Samples To Try Products. Trynbuy India is India’s first social commerce portal that lets you Try, Experience and Buy all in one go. They are the best way to discover new grooming, beauty, food and lifestyle products. They offer you free samples regularly so you can test product before buying. Getting free samples from Trynbuyindia.in is an easy task. So what are you waiting for? Order your Free Sample Products Today! 1. Go to the Website Homepage Here. 2. Register yourself or Login if you have already done the registration part. 3. Carefully choose the five categories because you will be able to make request from this category only. 4. Once a product from your chosen category comes in the stock, you will get an email alert. So be quick and order one for yourself before it becomes out of stock again. 5. Go to link provided in the mail or check yourself on the website from time to time. 6. 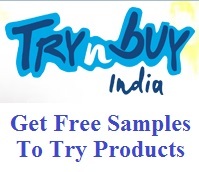 Add the available Trynbuy India Free Samples To Try Products to your cart. 7. Fill in your shipping details. =>Note: Please write a review about the product quality after you get the free sample otherwise they will stop sending free samples alert. =>Proof: Here is the pic of the free sample received by one of our viewers. This is Ariel Oxy Blu Detergent powder free sample. TrynBuy India is the best way to try top products from high-end brands. So enjoy Trynbuy India Free Samples To Try Products. Get fellow consumer reviews and advice, buy new favorites and earn points with every purchase. Every month Trynbuy India premium members will receive a curated box of your requested samples. They source the samples from both well-known brands and emerging ones. Their vision is to connect brands and consumers through social experiences and transactions. Like India Get Free Stuff on Facebook to get future updates on Trynbuy India Free Samples To Try Products. One of the best product!! i used ariel washing powder.